Dab on our gorgeous alcohol-free premium perfume oils on pulse points to release their heavenly aromas. Our oils offer a wide variety of exotic and unique scent journeys. Made from quality ingredients, they are all designed for personal care products. 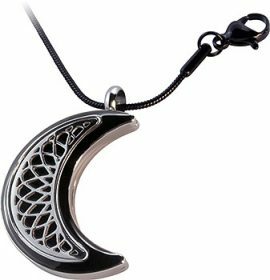 You can wear them straight as a perfume or use them for custom scenting our unscented personal care products. 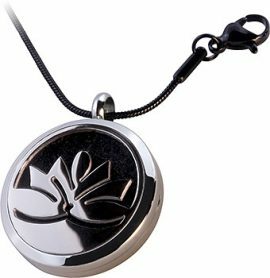 They are also perfect for perfume blending to create your own lovely signature fragrances. 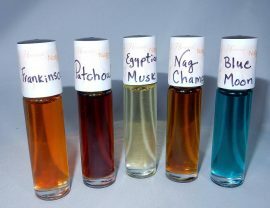 All perfume oils are available in 1/3 oz. rollette bottles or 1 oz. amber bottle. The 1 oz. size comes with an empty rollette bottle that you can fill and refill yourself. Powdery musk over orange and eucalyptus, creates a clean, fresh scent that wraps you in a fragrant embrace. Fresh and clean. Sweet, soft and light. A little musky with a light gardenia touch. An exotic oasis! Luscious and creamy, this single note fresh, creamy coconut instantly transports to the beach and blends beautifully with your favorite aromas. This natural outdoorsy fragrance appeals to both men and women. In addition, Earth is a great blending oil as it adds spice and depth to many of the perfume oils we offer. A spicy, earthy fragrance with woody notes of cedar, patchouli, vetivert and sandalwood. This modern fresh floral scent is playful, fresh, graceful and sensual. Nectarine’s original, authentic fragrance, fleeting green notes, fresh white lilies, Chinese roses, and clean musk, are enhanced with hints of sandalwood and moss for a sensual, powdery finish. A sensuous, modern unisex fragrance that’s full of character, yet reveals a tender, sensitive side. It blends a warm heart of exotic woods — Indian cedar and Himalayan blue pine, cashmere musk and Indian amber, with a refreshing splash of uplifting mandarin. Imagine a garden path filled with fragrant blossom, symbolizing innocence and first love. The heady, fresh aroma of crisp greens and spicy blossoms say Spring like no other.